Love the '80s? Miss big hair, rad music, and leg warmers? 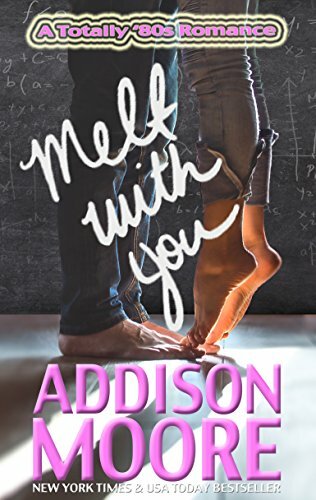 Take a step back in time with Melt with You (A Totally '80s Romance). It’s like totally awesome. I swear I didn’t see her. But I’m making it up to her every way I can. I’m driving her to school, helping her to all of her classes. I’ve never met anyone so down to earth—a girl who actually likes the things I like. Melissa Malinowski is a breath of fresh air. I can’t stop thinking about her. I swear I didn’t see her, but I should have. Melissa is too beautiful to miss. My name is Kelly Masterson, and nobody messes with me. I’m Joel Miller’s girlfriend. So Joel ran Mouse-akowski over with his truck. So what? He should’ve finished her off. And now he wants to break up? As if. Nobody breaks up with me. Joel is mine, and he’s going to stay that way. And after having a nice little chat with his mother, it’s become clear why he’s bending over backward to please that human speed bump. I’ll make sure Mouse-akowski understands this, too. That will be the end of Joel and his nerdy little plaything. My name is Kelly Masterson, and nobody messes with me. 1984 called and it wants to Melt With You. Other Books in "A Totally '80s Romance"